Cut 2 of the oranges into 8 wedges each. Peel and section remaining 2 oranges; reserve sections. Mix all Orange Marinade and Dressing ingredients; reserve half for dressing. In shallow glass or plastic dish or heavy-duty resealable food-storage plastic bag, place shrimp and remaining marinade. Cover dish or seal bag and refrigerate 15 minutes. Heat coals or gas grill for direct heat. Cut one onion half into wedges; separate into pieces. Thinly slice remaining onion half; separate into pieces and set aside. Remove shrimp from marinade; reserve marinade for basting. Thread shrimp, orange wedges and onion wedges alternately on each of eight 8-inch or four 15-inch metal skewers, leaving space between each piece. Grill kabobs uncovered 4 to 6 inches from medium heat 6 to 8 minutes, turning frequently and brushing with reserved basting marinade, until shrimp are pink and firm. Discard any remaining basting marinade. In large bowl, gently toss spinach, reserved orange sections, reserved thinly sliced onion and reserved dressing. Serve with kabobs. Use a small sharp knife to peel the orange, starting at the top; be sure to remove all the white pith from the fruit. To section an orange, gently slice on both sides of the orange section membrane. 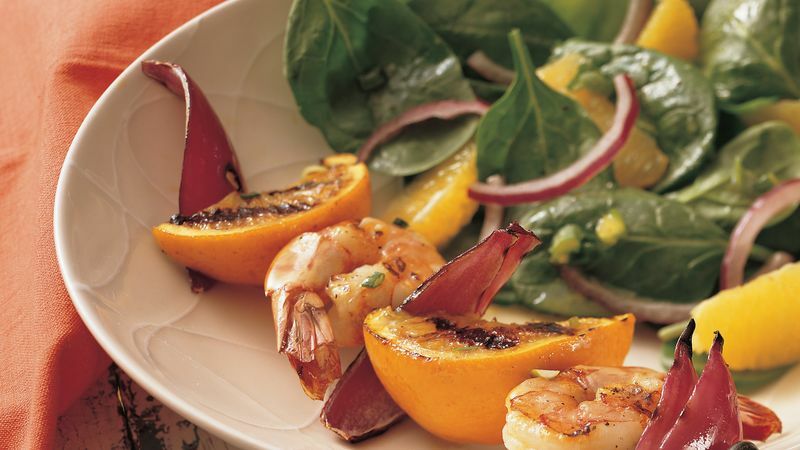 The shrimp, orange wedges and onion wedges can be grilled in a grill basket instead of on skewers. The Orange Marinade and Dressing can be prepared one day ahead; cover and refrigerate.